CHG Healthcare, a leading healthcare staffing agency, announced today the completion of a 18-month expansion and renovation project to its Fort Lauderdale-based Weatherby Healthcare and CompHealth offices at the Bayview Corporate Tower. With offices around the country and more than 2,600 employees, CHG has rapidly grown its talent base over the last few years. The 33,000 square foot expansion brings the company’s total occupancy to 150,000 square feet, which allows the company to grow by 140 employees, bringing the total employee count to 821 when at full capacity. Together with construction partner iConstructors, CHG created a space that visually represents the company’s core values, with amenities to improve employees’ experience in the office and enhance the company’s people-centric culture. CHG’s “putting people first” culture was a driving force behind the renovation, and many of the improvements were the direct result of employee feedback and recommendations. Space for social events. A main part of the renovation is a large gathering room with a newly installed harvest table, which is set up to host vendors, baristas, margarita machines and specialty drinks. There is also additional seating for the lunch hour, windows facing the ocean, large group seating and ping pong tables. 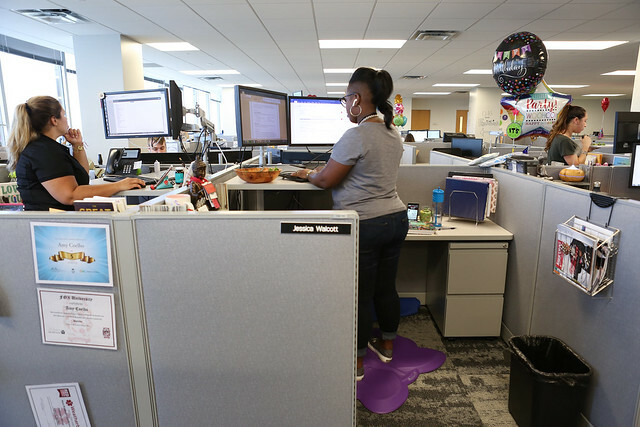 During Hurricane Irma, the space also served as a refuge for employees and their families who didn’t have a place to go for electricity or showers. Ergonomic design. Each worker has received an adjustable desk with dual monitor arms and power at their work surface to plug in their own personal devices. More meeting rooms. Each of the 21 new conference rooms are designed to have their own personality and their own themes. One room is themed “The Lodge” and is decorated with antlers and a woodsy feel, while another room is a library theme, complete with green felt on the walls and books that employees can borrow and return, like an actual library. The space will continue to enhance the award-winning culture of the CHG Healthcare family of companies. CHG has been recognized for nine consecutive years as one of Fortune magazine’s 100 Best Companies to Work For and is continually recognized for its dedication to its employees. Photos of the complete renovation can be seen here.